I am writing to share sad new that no one ever wants to, but must deal with, the loss of a parent. On Sunday I received the call from my brother no child wants, that my mother had passed away on Sunday morning, from an accident, while at a rehab facility for her back. I was so blessed I got to see her and her warm wonderful smile on Friday, prior to unfortunately attending a funeral for a fellow Forum member and dear childhood friend. I would like those of you who are still lucky enough to have parents alive, who supported you as a kid and our love of Wackies, to thank them for allowing you to be that silly child that still endures that childhood love into our adult years. I will tell you, if you have never been though this, it is a horrible thing, but is also part of the cycle of life and we can not cheat it, despite our best efforts. My mother was a very intelligent, vibrant and extremely funny woman whom enjoyed my Wacky Packages as much as I did, this is a special bond I will never forget. As we placed the earth up her casket and entombed her to the ground, I take some peace and solace in knowing she was my Wacky inspiration for the love I still have today for them, my sarcastic sense of humor and the qualities of a man and father I maintain today including my youngest daughter's love of them as much as mine. My sincerest condolences to you, Richard, on this news. Your mom sounds like she was a wonderful lady. Peace to you and your family. Sorry for your loss, Richard. I am sorry for your loss, as well. It's cool to hear how she enjoyed the Wacky Packages too. Very Very Sorry to hear that Surf. I lost my Dad last year and my Mom in 2003. It never gets any easier to lose someone till its ourselves that go. Be good, be kind and stay Wacky! After reading your words, I get the feeling that the best parts of your mother are not really gone, but simply living inside you now. It seems like she made sure of that. Even in your grief, your warm and happy feelings for your mother shine brightly. What a loving tribute you've shared with us here. We should all be as blessed as you obviously were. in subtle ways in the days to come to let you know she is ok. She will always be with you going forward. My condolences. Grief will come, but it is clear you have many fond memories in your heart that will carry on with you. In that way she still will be with you. Peace. My Dad is still around at 77, But my Mom left this earth back in Oct. of 2010 at the age of 66. When I started collecting Wacky's at the age of 9, neither one of them were particularly thrilled with the cards, But as I got older and discovered the Wrapper, the many non-sport shows I attended, and the sales I made along the way with some. Then they started seeing them in a different light. All my prayers and thoughts are with you tonight Richard. Mark AKA the Shoe. my deepest condolences, Richard. I knew you were attending a funeral, I had no idea it was your Mom's. I treasure every day he is here. Sorry to hear, Richard. 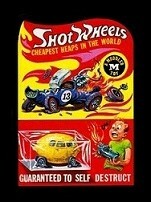 My mother bought my first Wacky Packages after getting a shot in the tookus for strep throat. I still remember the store where we bought them; thank God they were out of baseball cards! Your mother's memories will live with you and in you forever. So sorry to hear this news Richard. She sounds like a wonderful Mother and she will always be a part of you. Remember, you didn't lose her because you know where she is. And it's not an end to your relationship-just an interruption. You have my sympathy, believe me. Just know that you'll always have the love and the memories and no one and nothing can take that from you. I was in elementary school when Wackys came out (I missed the 1st Series, but got started with the 2nd) and my mom would buy them for if I did well at school or after a doctor's visit. Ah, if I knew then what I know now, I'd have saved up complete series runs (and I think that I had gotten a few of the pulled Wackys and never even knew that they'd been pulled). The 15th Series was where I stopped before we moved from PA to FL in 1977 and I didn't even know that the 16th even existed until years later. Of course, by then it was too little, too late. I remember collecting other cards as well, Topps or otherwise-You'll Die Laughing (1970s), Ugly Stickers (1970s), Planet of the Apes (1970s), Baseball Super Freaks and Football Super Freaks (man, what I wouldn't do to get all three of those series in excellent condition again), Crazy Magazine Covers, Crazy Cars (I got that series again!). Ah, those were the days! My condolences, Richard. It's so hard saying goodbye to those we love but most of us will have to eventually. I still have all my Wackys because my mother encouraged me to collect them - and NOT just stick them everywhere. She told me how her parents had tossed all her stuff when she went to college and that she'd never do that to me. She kept her word, and because of that I have my 1-16 run as well as thousands of comics, baseball cards and other things I collected. I'm sorry for your loss, Richard, and appreciate your taking the time to write such a lovely tribute to your mom. Although my dad passed away four years ago, my mom is still around and reading your words made me think back to my mom's involvement in my love of wackys. Although I don't think she was particularly enamored with them, she never discouraged me (or my brothers) from collecting them. In fact, she did use them as a reward for when we kids did something of which she approved. For decades she would go and visit people in local nursing homes. She would sometimes bring us kids, which the old folks really enjoyed seeing as, well, I suppose not many kids came around. Even though I was a shy kid who didn't really love those visits, I was thrilled to come home from school soon after and find my mom had gotten all of us a quarter's worth of Wackys. As much as I appreciated the Wackys at the time, I appreciate the example she set of doing something kind for others. Again, my condolences for your loss, Richard, and my appreciation for your post in bringing back those sweet memories. My thoughts and prayers are with you Richard. Thank you for sharing a tribute about your mom. Not a day goes by that I don't think about my parents. Thank you again so very much to everyone who has shared their kind, words, thoughts and stories. Like many, I was a geeky and uncomfortably shy child and I could play and hide in my Wacky Packages!!!!!!! This past weekend my sister and girlfriend and I spent the weekend packing up and sorting through her apartment, memories filling the day filled with laughter and tears; it's part of the process I am finding out.